Our Stoneleigh Nursery is a detached bungalow based in the quiet area of Stoneleigh, less than a 10-minute walk from our Worcester Park Nursery. Stoneleigh Nursery is also just a 5-minute walk from the nearest train station, providing excellent transport links for commuting parents. 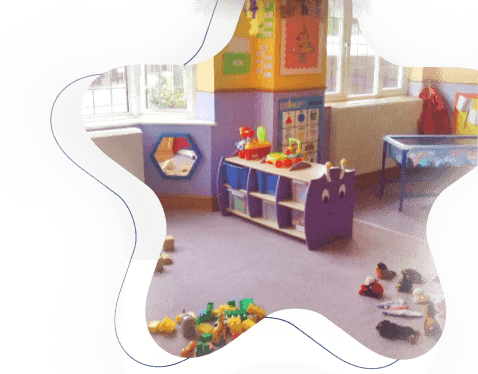 As with all of our nurseries, each age group has a separate area to learn and grow. We have the Little Stars room for babies, and the Rising Stars room for toddlers . At our Stoneleigh Nursery, we have a spacious garden which has safety surfaces and AstroTurf for safe, fun play. In the garden, the children have plenty of outdoor equipment to make use of. We always ensure that we have a variety of activities for the children that reflect the seven areas of learning outside. We like to let the children play out in the garden twice a day – weather permitting! – so they can get all the benefits of outdoor play.